Find information on Jupiter retrograde, here. 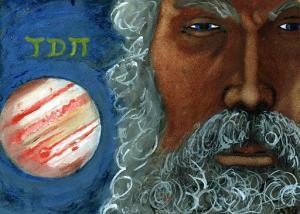 What does Jupiter Retrograde have to do with Jupiter Astrology? Jupiter retrograde goes on for around 3 1/2 months or so, then goes direct for the rest of the year. Jupiter is the planet of increase and enlargement. Jupiter governs the concepts of living joyously, existing always, cheerful feelings, unending youth and eternal life. Astronomers say retrogrades are a basic thing, but when it comes to Astrology, a retrograde Planet takes on new meaning. In Astrology, retrograde periods are looked on as a time when we have little control of what comes to pass. This is when things that are destined to happen, happen. In Astrology, Jupiter going retrograde has a weaker energy, although, Jupiter remains beneficial. What Power does a Jupiter Retrograde have? What can you Do about it? Just like other Retrogrades, the power here that's ordinarily external converts to a more internal power. When Jupiter is in retrograde motion, plans that were ready to be established or built up on might be held up, or terminated. A Jupiter retrograde period is a valuable time for folks to re-consider philosophical ideas and spiritual activities re-assess old beliefs, legal affairs and managerial practices. A Jupiter retrograde period is best used to deliberate or brainstorm, so that when the right time comes you may proceed. In doing this you may realize that the path you were on originally wasn't something that needed to be done after all. Jupiter retrograde is an ideal time to work on yourself, maybe, to do some self-improvement type of things. When in direct motion Jupiter brings out, so, in a retrograde we should bring in (meaning inside). We should sort out, self-examine and realize. How does a Jupiter retrograde influence you? Since Jupiter is the biggest planet, we'll feel numerous shifts in its period. When Jupiter goes retrograde we may feel blue and susceptible to criticism or persuasion or temptation. A Jupiter in retrograde enables you to derive discernment, insight, and a wisdom that is gained from being attentive of the lessons learned through past experiences. A Jupiter's retrograde frequently tries your trust. For instance, you have been on a lucky streak in some matter prior to a retrograde, then bam...boom...things change and it all goes pear shaped, it's now a battle that leads to losing trust and faith , "Waa-Waa!" During a Jupiter's retrograde, money will be low or not there at all for things you may want.You shouldn't splurge on things that you don't need. You shouldn't pick this time to quit your job for another; you may not last there when Jupiter goes direct again. You shouldn't quit work at all, because you may not even find one at this time. Like mercury, Jupiter governs travel; Mercury for short trips and Jupiter for long distance ones. Once Jupiter is retrograde, your itinerary may be inauspiciously impacted. During a this retrograde some the things that Jupiter governs reverse and turn negative. People become conceited, they think they know everything and they are wrong, good advice is waved off. The Jupiter open mind becomes petty. Jupiter's retrograde period cues us in to the old adage "we're all in this together". We find that after something has touched us or the people we love, we have become more sympathetic to others. We see that we share many of the same experiences, joys and sorrows. Did you read Moon astrology?